Whoever is thinking up the events is getting more and more obnoxious. 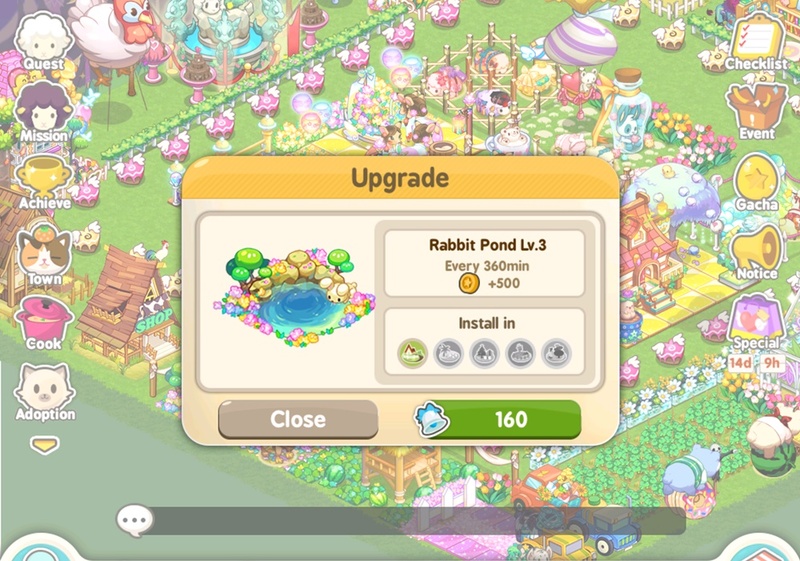 During the first few years of the game, simply breeding and completing simple tasks were enough to obtain event-only animals. 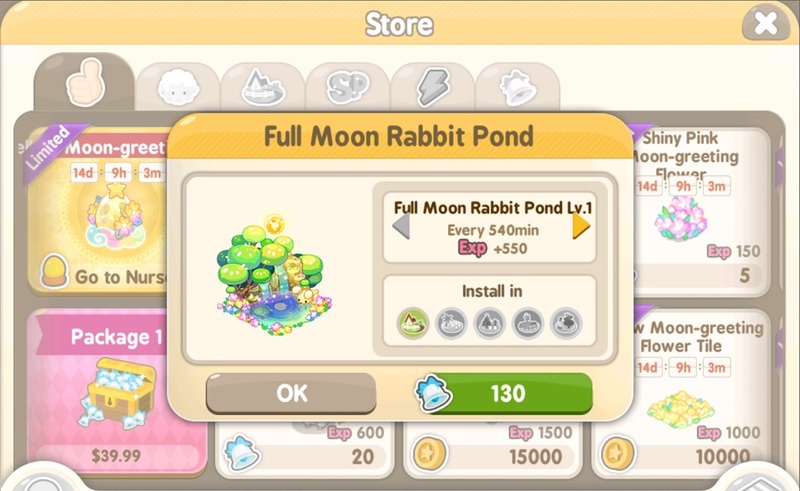 Now most of them come from the lucky draw bag — one of Tiny Farm’s gacha systems — which put players at the mercy of random number generation and pure luck. Success rates are quite abysmal, but that’s typical for a lot of freemium mobile games, isn’t it? 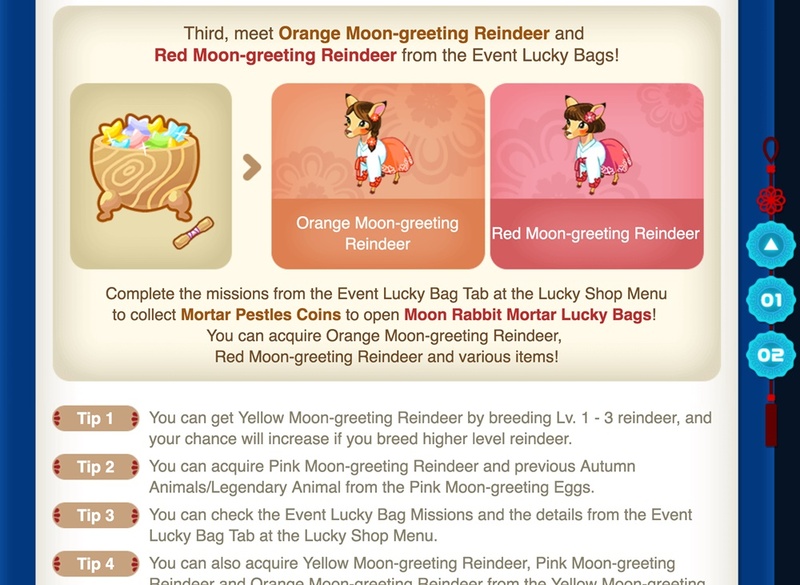 The main method to get the Orange and Red Moon-greeting Deers are from the lucky bag draws. An alternate way to obtain the Orange one is through another gacha (re: event egg draws) while one Red deer can be gained from completing a string of tasks. I was lucky and received both upon my first multi-bag draw. (Players have the option to draw one bag or 10 bags at once.) 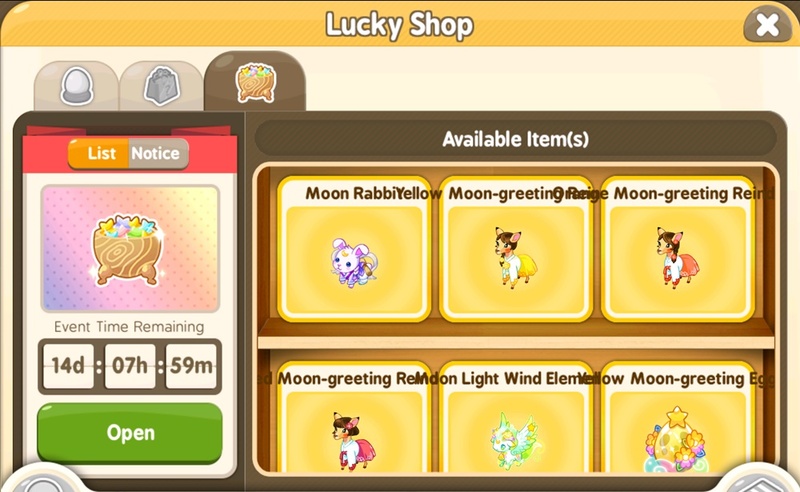 Such luck is doesn’t happen often though; I usually need to do a few more multi-bag draws before I even get one animal. Sometimes it may take until the final few hours of an event before it happens due to the amount of time needed to collect enough tokens or coins to do them. 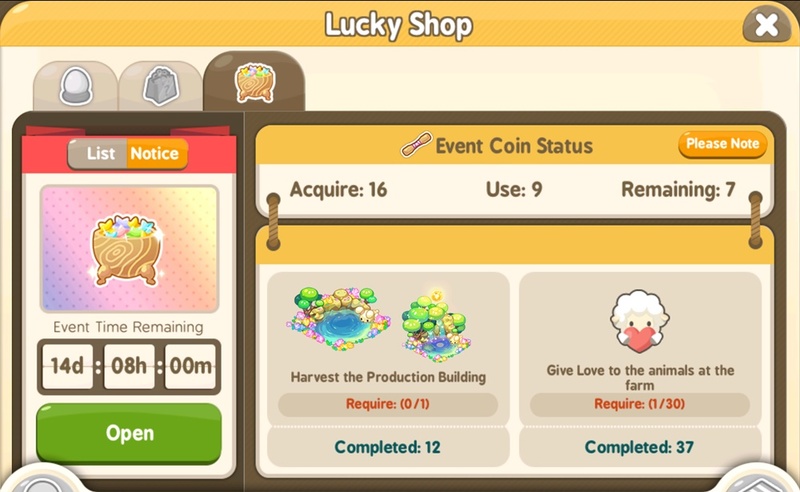 Harvest 1 time from either building and give love to animals 30 times for 1 coin. The rare prizes available from the draw. In most cases, one of the buildings will come from completing a timed quest. Its default production time is 12 hours, I believe. Production time can be decreased, however. By spending the premium currency known as Bells, the first building upgrade will drop the time to 8 hours. The second upgrade will max out the time to 6 hours. 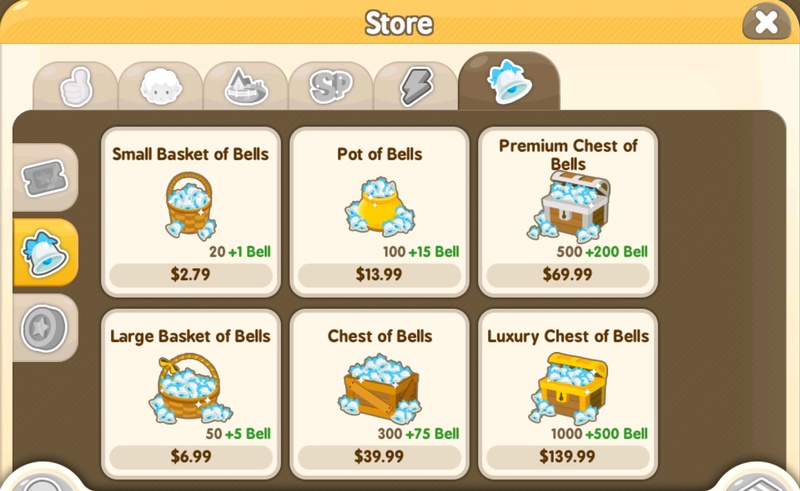 There is typically a second building that can only be purchased with Bells. For the current event, the premium building comes with a production time of 9 hours. Two additional upgrades follow; the first will reduce it to 6 hours, and the final one brings the time down to 3 hours. All upgrades for the free building as well as the second building and its upgrades do not come cheap and cost a few hundred Bells all together. You’re probably looking at at least $30 US for EACH EVENT. And events vary between weekly and biweekly. There are some cases where they may run for 3 weeks too such as this Mid-Autumn Festival event. Regardless of length though, there’s no denying that Tiny Farm is a heavy investment. Every event has special Bell & Gold packages that come with little bonuses. Prices listed are in Canadian Dollars. The Bell packages. Prices are in Canadian Dollars. All in all, that’s a lot of money for folks that want as many chances at the gacha as possible. And lord knows there are a handful that are willing to fork over the money just for that. 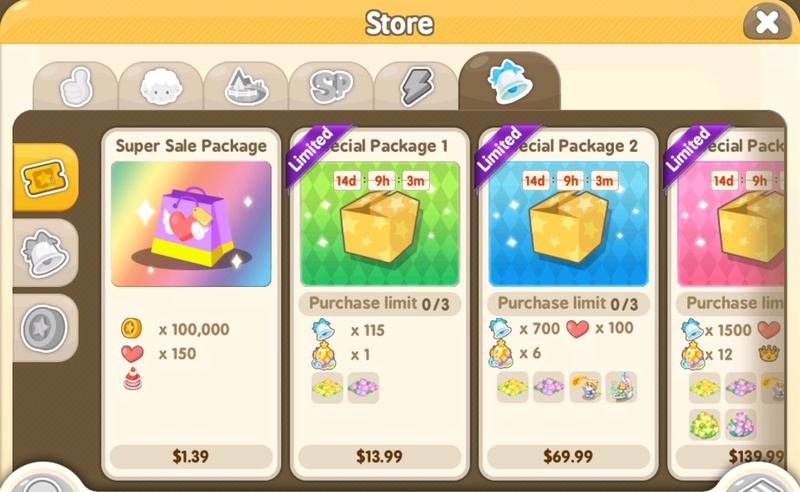 The rest of us that can’t or aren’t willing to factor Tiny Farm into their monthly budgets can only pray that the few lucky bag draws they do will get them the event animals. Yes, I’m fully aware there are multiple ways that we can get Bells other than buying them, but there’s never enough time to save up those “free” Bells for every building upgrade or to buy each premium production building, is there?